Globsters from around the world. Images via Wikipedia. It was not a bird, plane, or even Superman himself. 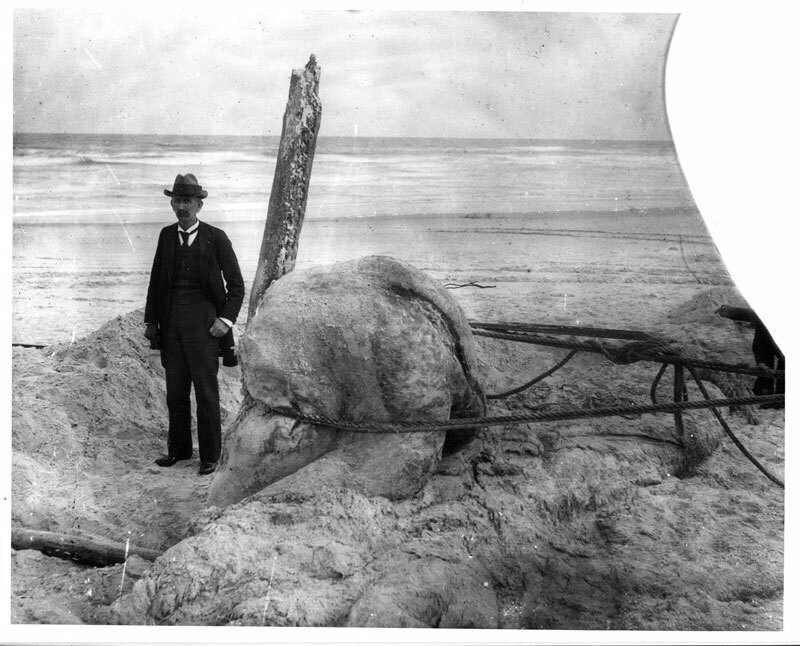 In 1896, two boys found a…thing that had floated to shore on Anastasia Island, Florida. What followed were decades of mystery, and even a 2016 horror movie. However, the origins of this “monster” were far simpler than many wanted to believe. 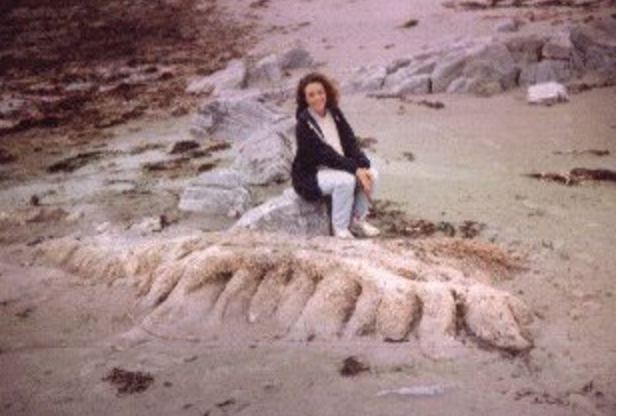 The St. Augustine Monster. Image via Smithsonian. Decades of confusion ensued. 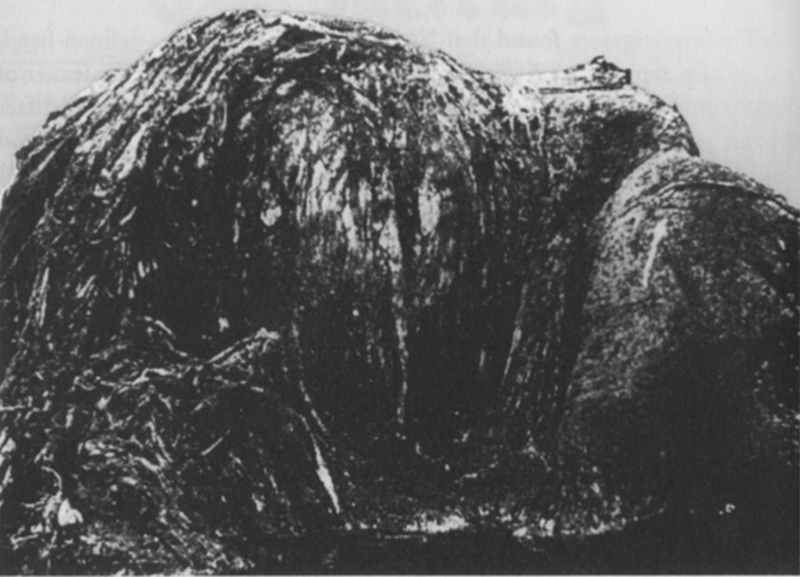 Webb thought he saw tentacles in this mass of flesh and he contacted Yale’s Professor Addison Verrill. Verill in turn, modestly, named the blob Octopus giganteus verrill. Verill’s analysis indicated that “when living, it must have had enormous arms, each one a hundred feet or more in length, each as thick as the mast of a large vessel, and armed with hundreds of saucer-shaped suckers, the largest of which would have been at least a foot in diameter.” The fact that the largest octopus is only 20 feet did not matter. Webb and the “monster.” Image via Smithsonian. Frederic Lucas, “a Carl Sagan of an era of lantern-slide presentations and crowded lecture halls,” was a contemporary of the St. Augustine Monster who was not fooled into thinking it was an octopus. He knew this monster was no such thing, and he concluded as much, “disppoint[ing] the masses with the scientific fact, identifying the ‘blob’ as no more than decayed whale blubber.” Lucas’s conclusions were not enough to put an end to the international sensation that the monster had become (Lucas himself was prone to misidentifying sea creatures. During the shark attacks in New Jersey in 1916, he was adamant that sharks lacked the draw strength to snap human bones). 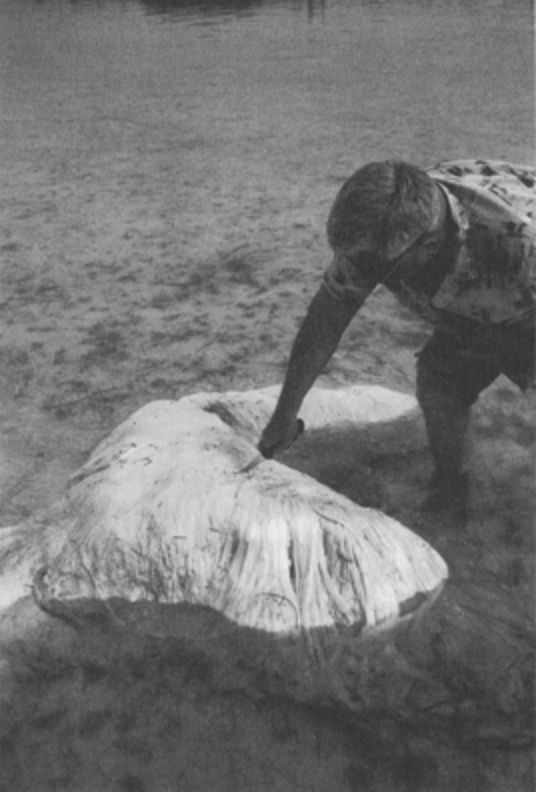 One day, Verrill had the chance to examine the specimen and determined that it was actually the upper part of a sperm whale’s head. However, a lie can go halfway around the world while the truth is putting its shoes on. 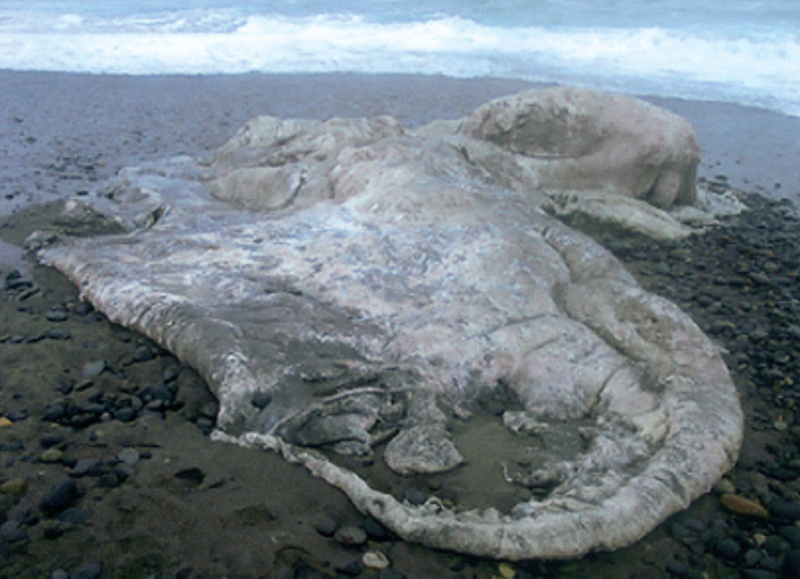 Over the next several decades, other “globsters,” or “unidentified organic mass[es] that washes up on the shoreline of an ocean or other body of water,” appeared. The Dunk Island Carcass of 1948, the Tasmanian Blob, and the Chilean Blob of 2003 all had their times to shine. Conspiracy theories mounted with each globster. During the 1970s and 80s, in the wake of the popularity of the book Chariots of the Gods (1968) and TV programs such as the BBC’s series Arthur C. Clarke’s Mysterious World, monster once again captured the public imagination. 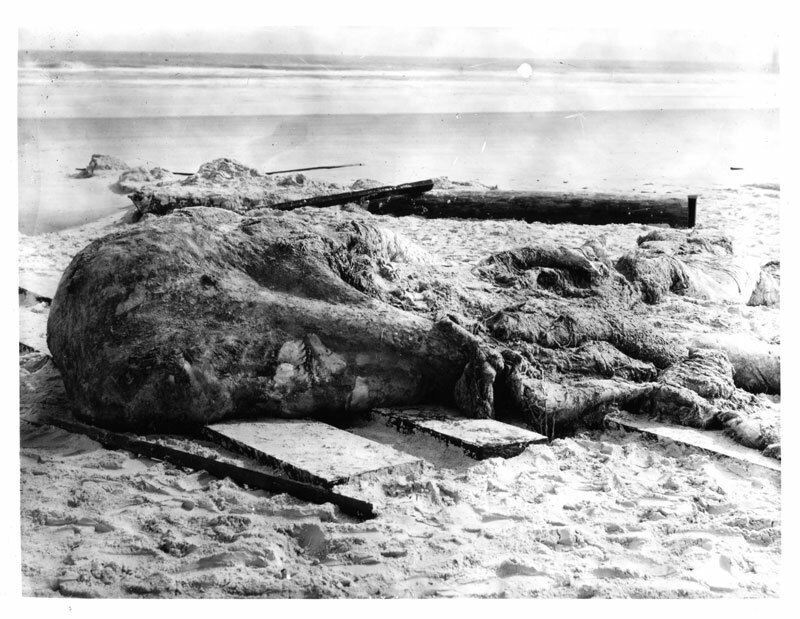 As if a gigantic octopus wasn’t enough, one author even speculated that it was the remains of a giant space alien. Enough interest was generated that the Smithsonian began receiving requests for samples of the monster. In 1995, electron microscope and biochemical analysis indicated that the material was collagen from a warm-blooded mammal. In 2004 DNA tests applied to the St. Augustine sample along with other monster remnants from around the world identified all as the collagen matrix that holds together . 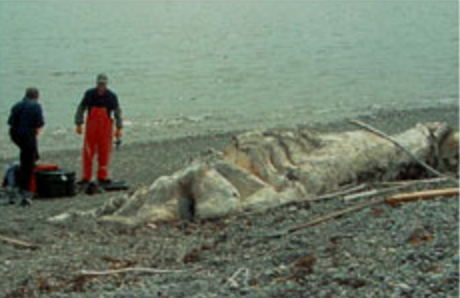 . . whale blubber. These tests were huge blows to conspiracy theorists. 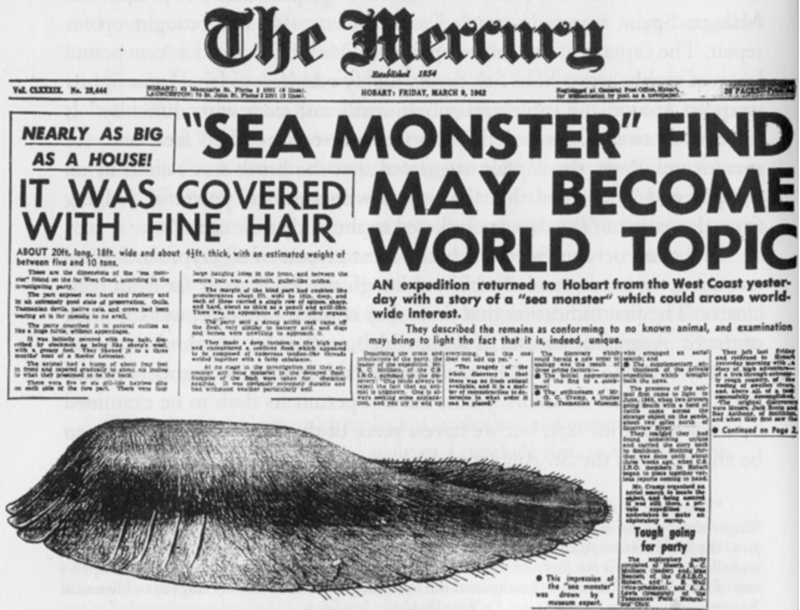 At the time of the announcement, Richard Ellis, the author of a book called “Monsters of the Sea,” was “crushed. It’s a blow for people who continue to want there to be great and scary monsters out there. It may be the requiem for blobdom, but there are other possibilities” for monsters in the ocean, even though globsters are not among them. For more profiles in nature, from the Battle of the Cats to a Steve Irwin $100 bill to a deadly octopus to how 20% of fish eaten are mislabeled to a fish that weighs more than a pickup truck to a $300,000 fish to a fish named after Obama to a truly living “living fossil,” read here! For more on the story behind Hacksaw Ridge, political video games, Greece’s Brexit over 2,000 year ago, the Battle of the Cats, America’s first Donald Trump, and more, check out the rest of my Profiles in History here!